Lyde Court wedding venue in Herefordshire set the unique and fantastic celebrations of Angharad & Matt for their New Years Eve Cotswold wedding photography. Where do I even start with this wedding? 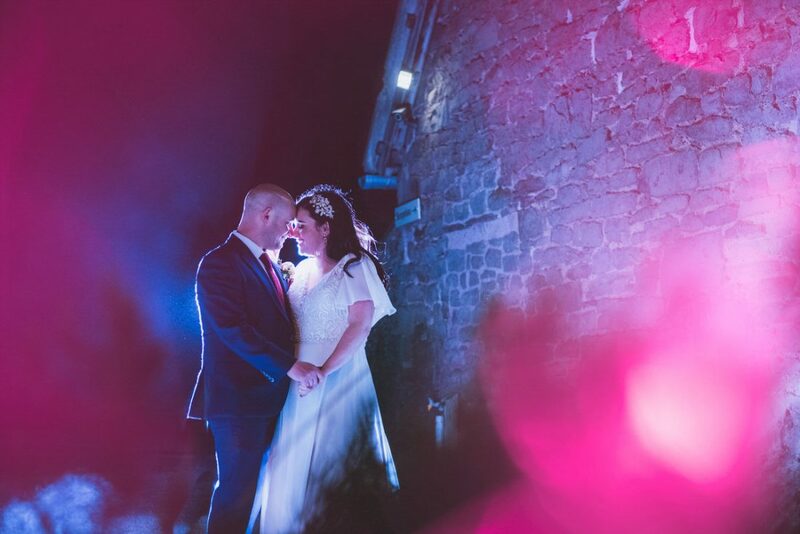 Well Angharad & Matt booked me November 2017 and Angharad’s excitement in her wedding plans was a pleasure. It’s always great to work with such a great plan and a couple that are a little more openminded to ideas. Before we dive right in… how quick did this year feel like it went?! I joined the couple at the venue. A final drive of 2019 from Cardiff along some lovely sweeping hills and farm land. A little reflective and meaningful in equal measures. I arrived to the venue which was a first for me for photography at Lyde Court. I was excited as I really feel my creativity can peak within new locations. Angharad, the bride, was amongst her 2 daughters who were flower girls and other bridesmaids as they enjoyed the morning celebrations and final hours ahead of the ceremony. Lyde Court certainly don’t shy away from details and putting on a show. Their 17th century stone barn the centre feature with it’s skyscraper tall like vaulted ceilings, elm beams spread across the room and arrow slit windows trapping any light outside. 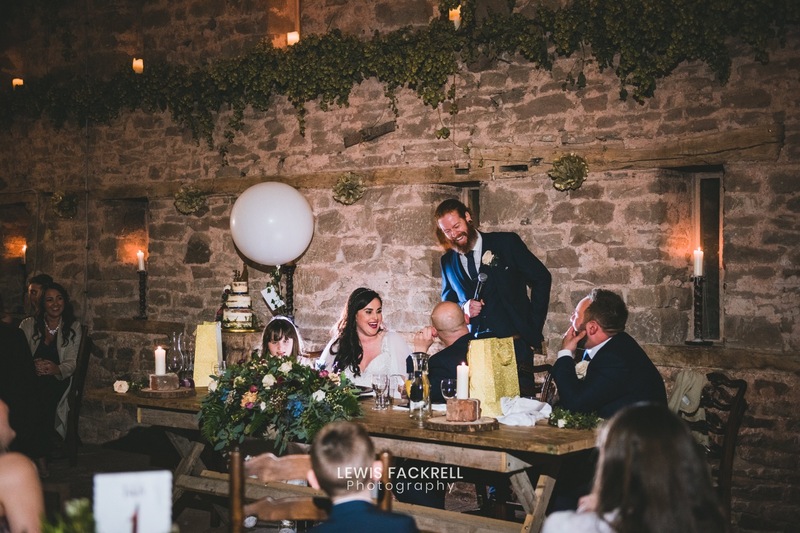 Candle light and fairy lights are the only light source that set such an atmosphere for a wedding! The venue was packed full of character which of certainly is a fascinating background as a photographer. I captured several details through the day which you can see below. The bridal preparation room. set in such a particular and eclectic space. Filled with collection of ‘things’ including an appealing wall of cameras… several I could tick off as owning myself. With the scene set. there was lots of ‘flowing’ prosecco, a recent run to the local Mc Donalds and the hair and make-up suppliers set up and ready to go. A great start to the day. It wasn’t long before their guests had arrived. The groom and groomsmen finely suited and booted, eagerly anticipating with a touch of nerves from all 3 setting in. I caught Matt, the groom for a few ‘prep photos’ with the best men finalising the boutonniere to his lapel ahead of having some pictures together, they opted to hold hands… certainly wasn’t my prompt. Using the stunning Lyde court wedding venue as many backdrops for their portraits. The main house and archway of fairy lights was also a stunning scene to use. We were spoilt for choice. We picked it back up later in the evening when it got a little darker to maximise the lighting and of course the fireworks to top the night off! What a stunning venue. Love your evening portraits mate! Looks like an absolute corker! Great set. Cheers Mate, absolutely awesome day, exhausted at the end of it but it was certainly worth it! Love the first dance shot, perfecto!! Great wedding! So many great images Lewis with powerful storytelling throughout! Love the fireworks! Ohh thanks so much! Yeah, the fireworks were pretty awesome! Nice work Lewis. Handled all the different lighting situations very well. Thanks Tommy! It was a technically challenging day throughout, certainly a boss level to end 2018! Stunning work Lewis – the one of the guys holding hands is hilarious! Cheers Bert! Self prompted that too haha! Had to keep that moment in for sure.